“Grundfos Pumps” is “one of the world's leading pump manufacturers offering a wide range of reliable pumps. Producing Circulator pumps for hot water circulation in central and district heating systems and in domestic hot water service systems, circulation of cold water and other liquids in cooling and air-conditioning systems. Industrial applications for the transfer of water, cooling lubricants and other Liquids in industrial and process systems as well as built-in components in OEM equipment (Original Equipment Manufacturers). Pressure boosting and liquid transfer by Vertical and horizontal centrifugal pumps and booster systems for liquid transfer and boosting of hot and cold water for e.g. irrigation, golf courses. Groundwater supply by Submersible installed pumps, used for irrigation and groundwater lowering. In addition to pumps, Grundfos manufactures both norm and submersible motors for the pumps. Domestic water supply such as Submersible pumps, jet pumps, multistage centrifugal pumps and compact systems for water supply in homes, gardens and hobby applications. Wastewater application such as Drainage, Effluent and Sewage pumps, for a wide range of applications in building services, & the industry as well as transfer of raw sewage in municipal sewage systems and treatment plants. Environmental applications as Purpose-built submersible pumps for remedial pumping of contaminated groundwater and for sampling for water quality analyses. Dosing and disinfection systems and measuring & control for wastewater treatment systems, swimming pools and industry. Renewable-energy based water supply systems suitable for remote locations not connected to the electricity supply grid. As well as Fire Fighting Pumps UL/FM Listed pumps & non UL Listed. Furthermore, Grundfos develops and sells state-of-the-art electronics for monitoring, controllers for pumps and other systems”. 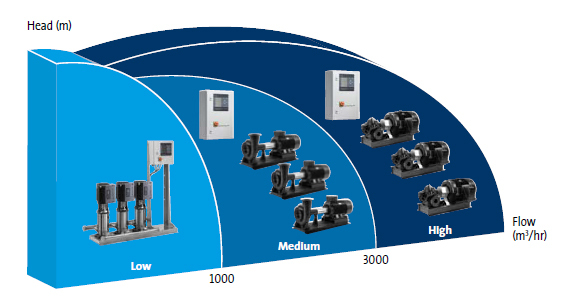 In order to maintain its leading position, Grundfos constantly places a great emphasis on research and development through making use of the latest technology within the pump industry, and constantly striving to make its products more reliable, energy-saving and efficient, equipped with ultramodern electronics. Highly efficient pump set that are mainly mounted under water, ideal for fountains, domestic use in buildings, hotels, gardening and irrigation, even in industries for clear water handling and special pumps built for high pressure and dirty water. This set of pumps is particularly easy to install and demolish, more dependable and has higher stability with a longer life span and lower maintenance expenses. Usually used to cover small areas like buildings and is energy efficient and overflows smoothly. Pumps are ideal in any boiler operation, used effectively to control the amount of water supplied to the boiler. These pumps in particular are the ultimate component of a reverse osmosis unit; it’s capability of producing high pressure applied to the unit as well as the osmotic pressure makes it ideal for water desalination plants. Ideal for HVAC applications, district and central heating systems, pressure boosting, these pumps handle hot and cold water through buildings for cases of space heating, air conditioning and supplying hot water through heating pipes, appliances and water supply. 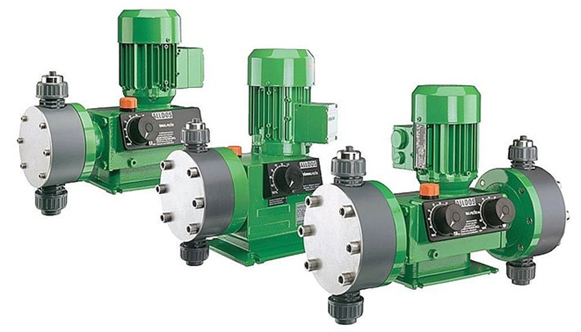 These pumps are also favored in OEMs (original equipment manufacturers) & are the ultimate in reliability in industrial and heavy duty commercial applications. Grundfos fire fighting pumps are tested and certified by FM (Factory Mutual) Global and UL (Underwriters Laboratory) to comply with the requirements of the NFPA 20, system consists of three pumps: one pressure maintenance pump (jockey pump) and two fire pumps, one duty and the other acting as standby (Electric & Diesel driven). Used mainly in pumping (also called lift stations) are normally designed to handle raw sewage usually fed from underground pipelines and lifts the sewage until it reaches its destination which is usually a water treatment plant, moving waste to higher elevations. Usually designed to handle normal peak flow, they are specially designed with large open passage to avoid clogging with debris or floating solid, although some macerate any solids within the sewage breaking them down into smaller parts which can more easily pass through the impeller. Usually used in waste water applications, these low volume pumps are used in a variety of commercial, industrial, municipal and agricultural applications. ” ARISTONCAVI” Cables “ is one of the most important manufacturers of rubber insulated low-voltage and medium-voltage cables. Aristoncavi has achieved leading positions for the “special application” cables. ARISTONCAVI activity started in 1958 manufacturing electric cables for different applications. Electric Cables Categories: 1. Cables resisting fire and high temperature, 2. Cables resisting heavy-duty conditions, Able to withstand mechanical stress, atmospheric conditions and chemical attacks (oils, hydrocarbons, corrosive agents). 3. Cables resisting to liquids able to withstand different liquid elements (fresh and sea water, waste water, etc). Aristoncavi also developed DRINCABLE, a cable suitable for use in drinking water. The special sheath compound does not give out any toxic substance, thus preserving the potability of the water. As well as specially engineered and developed to solve a customer’s special application requirements. Rubber-insulated flexible cable with polychloroprene sheathing resistant to mechanical stressed, oils, chemical corrosion and weathering. “Hatboru” Factory is one of the main steel pipe manufacturer in Turkey and having a good reputation, since its establishment in 1964 Hatboru sustained his production of irrigation system pipes till beginning of 1998, and expanded the production range with saw / spiral (submerged arc welded) steel pipes for potable water, petroleum and gas pipelines in addition to construction and piling. Hatboru manufactures Steel pipes, casing steel pipes, plastic pipes, seamless pipes and well screens. “Aytok”, which started with producing drip irrigation plastic extension piece in 1997, now is on the way of becoming a leader organization in Turkey by producing filters in metal group. Aytok which is common first to mind when as regard as filtration systems in Turkey, is indebted to its quality policy. Aytok with its quality which is available to international regulations has started to make its name in global markets. The reason of the development of Aytok is R&D. Aytok which presents qualified and durable products for water needs with more economical prices to its costumers has been exporting to 50 countries in 5 continents.